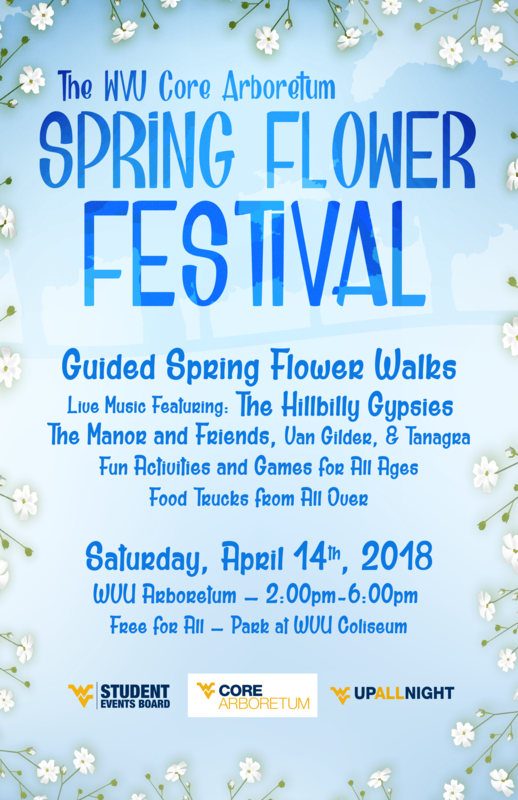 Come to WVU Core Arboretum for our first Spring Flower Festival on Saturday, April 14, from 2-6 pm! This family-friendly, free event is open to everyone and will showcase the beautiful spring ephemeral wildflower display that happens every year in the Arboretum. We will have wildflower tours, lawn games, nature activities for kids, food, live music and lots of information about other Arboretum programming. These flowers only last a couple weeks every year, so catch them while they’re out! Spring will soon be here! Mark your calendars for the WVU Department of Biology spring ephemeral wildflower walks and the Mountaineer Audubon spring bird walks. These free, guided tours are a spring tradition at WVU Core Arboretum. Last year, in the course of three wildflower walks and four bird walks, over 45 species of plants were seen in bloom and over 70 species of birds were seen and/or heard. The wildflower walks will happen on three Sundays in April (April 8, 15, 22) at 2 pm. The bird walks will be the last two Tuesdays in April and the first three Tuesdays in May (April 17, 24 and May 1, 8, 15) at 7:30 am. All tours will meet in the Arboretum parking lot. Additional free parking is available at the nearby WVU Coliseum. No reservations are needed. Dress appropriately for the weather and for hiking. Additional wildflower tours will be added to the schedule in April, as volunteer tour leaders become available! 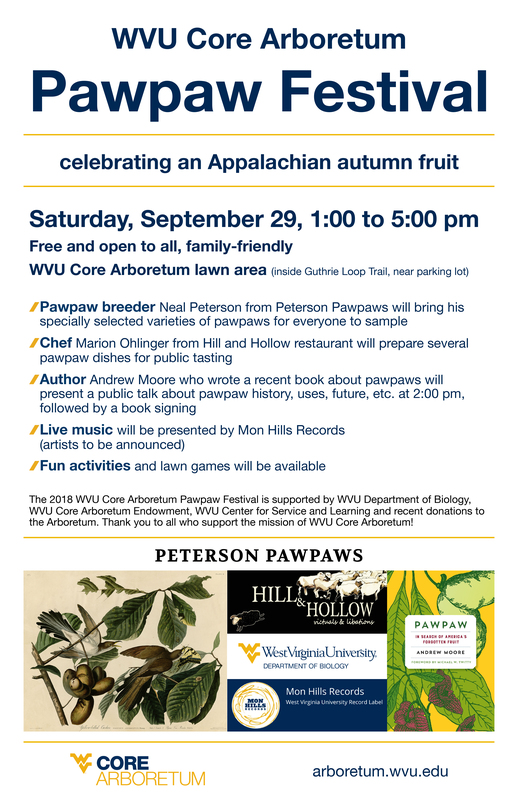 Coming Soon: Pawpaw Parties at WVU Core Arboretum! Come to WVU Core Arboretum to taste pawpaws! Pawpaw (Asimina triloba) is the largest fruit native to West Virginia. Pawpaws have a luscious, tropical flavor that some describe as a combination of banana, mango, and pineapple and a smooth, creamy texture. Pawpaws ripen in Fall, and the Arboretum’s trees typically produce enough ripe fruit to gather sometime in September. To celebrate and share this delicious fruit that grows naturally in WV, WVU Core Arboretum hosts Pawpaw Parties every year. Even though pawpaws are fairly common, many people have never tasted a pawpaw, and we hope to change that! Pawpaw Parties are rather informal, but they have become a much-anticipated annual event at WVU Core Arboretum! A table will be set up in the lawn area at the Arboretum, and all are welcome to stop by and try a pawpaw. Literature about pawpaws and how to grow the pawpaw seeds that will be left after trying the fruit will also be available. Depending on how long the pawpaw season lasts, we will try to host several Pawpaw Parties. Pay attention to the Calendar of Events section of this webpage for more details. Pawpaw Parties are free and open to all. Next week (July 22-30, 2017) is National Moth Week, and WVU Core Arboretum is celebrating by inviting everyone to a Moth Night at the Arboretum! Wednesday, July 26, from 9-11 pm we will have sheets and lights set up in the Arboretum lawn area to attract moths, and experts on hand to identify the moths that we attract! There is not a formal program, and all are welcome to stop by any time between 9 and 11 to learn about moths and how to attract and study them. The event will be cancelled if it is raining. Nature Connection at WVU Core Arboretum! Local and regional experts on a variety of nature-related subjects will give public talks at the Arboretum each summer as part of the new WVU Core Arboretum Nature Connection Series. The Nature Connection Series talks happen on Tuesday evenings at 6:00 at the WVU Core Arboretum Amphitheater, starting in early June and continuing through late August. See our Calendar of Events for speakers and talk titles. These talks are free and open to all, and no registration is required. All of the talks are outdoors, so please dress for the weather. Some of the talks include walking and/or fieldwork. Talks will be moved or cancelled if the weather is inclement. 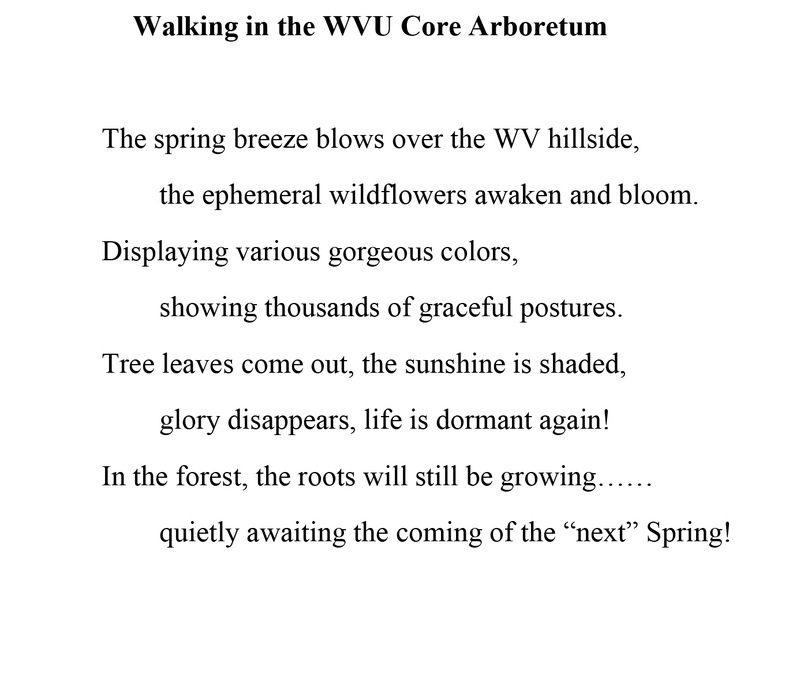 Come be a part of the WVU Core Arboretum nature crew! The 2017 WVU Core Arboretum Nature Connection Series is supported by the WVU Department of Biology, the WVU Core Arboretum Endowment, and the Robert C. Cull Outreach Fellowship. All speakers are volunteers. Thank you to all who support the mission of WVU Core Arboretum! Spring will soon be here! Mark your calendars for the WVU Department of Biology spring ephemeral wildflower walks and the Mountaineer Audubon spring bird walks. These free, guided tours are a spring tradition at the WVU Core Arboretum. The wildflower walks will happen on three Sundays in April (April 9, 16, 23) at 2 pm. The bird walks will be the last Tuesday in April and the first two Tuesdays in May (April 25 and May 2, 9) at 7:30 am. All tours will meet in the Arboretum parking lot. Additional free parking is available at the nearby WVU Coliseum. No reservations are needed. Dress appropriately for the weather and for hiking. Pawpaw Parties at WVU Core Arboretum! Come to WVU Core Arboretum to taste pawpaws! The pawpaw (Asimina triloba) is the largest fruit native to West Virginia. Pawpaws have a luscious, tropical flavor that some describe as a combination of banana, mango, and pineapple and a smooth, creamy texture. Pawpaws ripen in Fall, and the Arboretum’s trees are starting to produce enough ripe fruit to gather. Pawpaw Parties will be on Thursday evenings from 5:30 to 7:00, or while supplies last! A table will be set up in the lawn area at the Arboretum, and all are welcome to stop by and try a pawpaw. Literature about pawpaws and how to grow the pawpaw seeds that will be left after trying the fruit will also be available. Depending on how long the pawpaw season lasts, we will try to host several Pawpaw Parties. Pay attention to the Calendar of Events section of this webpage for more details. Pawpaw Parties are free and open to all. Come to the WVU Core Arboretum to taste pawpaws! The pawpaw (Asimina triloba) is the largest fruit native to West Virginia. Pawpaws have a very luscious, tropical flavor that some describe as a combination of banana, mango, and pineapple and a smooth, creamy texture. Pawpaws ripen in Autumn, and the Arboretum’s trees should soon produce enough ripe fruit to gather. Our first Pawpaw Party will likely be in a week or so. We will have pawpaws to taste and information about pawpaws and how to plant pawpaw seeds. Pawpaw Parties are free and open to all. Stay posted for more details! Announcing: WVU Core Arboretum Work Day Wednesdays! The WVU Core Arboretum is starting a volunteer work program—Work Day Wednesdays. Volunteers help keep the Arboretum beautiful, and you can be a part of the crew each Wednesday, starting on August 31, from 4-7 pm! We will work on trails, do invasive species removal, clean drainage channels, maintain lawn areas, etc. The program is open to all. It is hard work, but good exercise, and it is much appreciated by the Arboretum’s many users. Interested volunteers should email Zach Fowler (zfowler@mail.wvu.edu) to schedule a time slot, and register on iServe. There is a limit on the number of volunteers that we can accommodate each day, but the program will be ongoing. Volunteers will meet near the Arboretum parking lot. Volunteers should wear closed toe shoes, long pants, and clothes that are okay to get dirty. The event will be cancelled if the weather is dangerous. Thanks to all who visited the WVU Core Arboretum for the Magicicada Festival on Saturday, May 28, and thanks, especially, to the volunteers that made it happen (including the chefs)! More than 70 people came to the morning events, and well over 300 people came to the afternoon events! It was wonderful to see so many members of the community come out to an educational event and actively engage with science and the University. Participants learned about cicada biology and ecology, watched talks on current cicada research, did cicada-related arts and crafts activities, and ate cicadas prepared by great local chefs! People also got to see plenty of cicadas and learn how to tell the different species apart. It was a celebration of cicadas! If you have not gotten to see or hear the cicadas yet, there are still plenty of them at the Arboretum, and there will be for a few more weeks! They are even chorusing in the bushes around the parking lot today. The WVU Department of Biology Spring Ephemeral Wildflower Walks and Mountaineer Audubon Spring Bird Walks at the WVU Core Arboretum were a success this year! In the course of three wildflower walks and four bird walks, over 45 species of plants were seen in bloom and over 70 bird species were seen and/or heard. We had great participation from community members and students, also! It seemed like everyone really enjoyed themselves, including the guides, and hopefully everyone learned something new. Most of the spring flowers are gone now, but the summer flowers are just getting started, and many of the birds will be here and singing for most of the summer. Come visit! As part of my research with the West Virginia Climate History Project, I am monitoring the wildflowers in the Arboretum to determine how long the flowers are in bloom. I will be monitoring bloodroot, trout lily, and cutleaf toothwort, which are wildflowers that bloom for a very short amount of time. 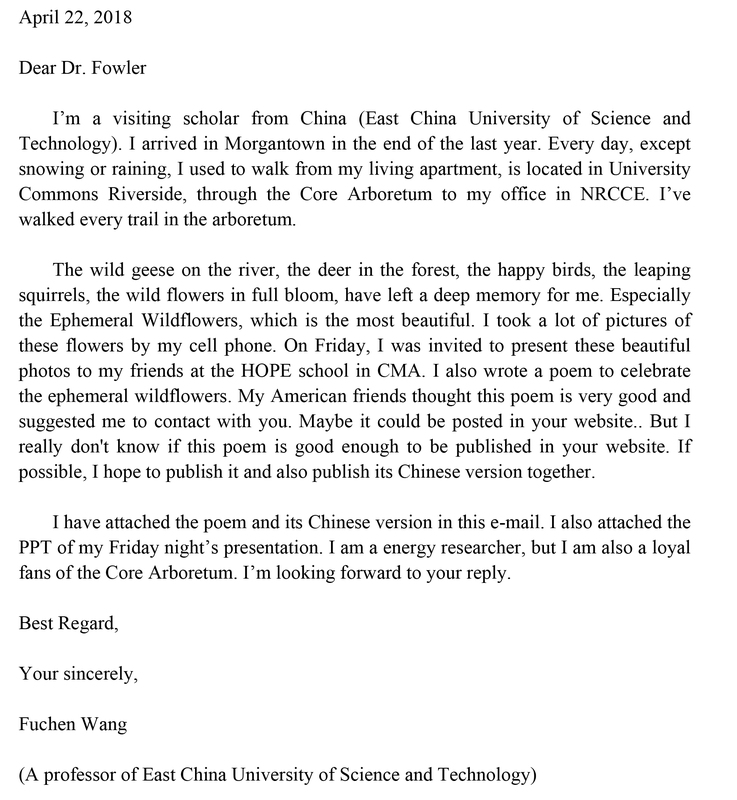 I am also interested in learning how elevation in the Arboretum affects when the flowers bloom. This is part of a bigger research question that addresses how wildflowers are responding to a warming climate. If spring is coming earlier than it did 100 years ago, then how are the plants and animals responding? By studying spring wildflower blooming and bird migration in our backyards, we can better understand the future of ecosystems in the face of a changing climate. Lori Petrauski is a graduate student and Graduate Teaching Assistant in the WVU Division of Forestry and Natural Resources. Spring is here! Mark your calendars for the WVU Department of Biology spring ephemeral wildflower walks and the Mountaineer Audubon spring bird walks. These free, guided tours are a spring tradition at the WVU Core Arboretum. The wildflower walks will happen the last three Sundays in April (April 10, 17, 24) at 2 p.m. The bird walks will be the last two Tuesdays in April and the first two Tuesdays in May (April 19, 26 and May 3, 10) at 7:30 a.m. All tours will meet in the Arboretum parking lot. Additional free parking is available at the nearby WVU Coliseum. No reservations are needed. Dress appropriately for the weather and for hiking. Volunteers from WVU Sierra Student Coalition, WVU Climbing Club, and a few who found us through the new WVU iServe helped with some spring cleaning at the Arboretum. They picked up lots of trash from along the banks of the Monongahela River on Saturday, March 5! We do not have a user-generated litter problem here at the Arboretum, but the river continually deposits trash along its banks. This clean up is an annual task, unfortunately. Volunteers help keep the Arboretum beautiful! Members of the WVU Sierra Student Coalition volunteered at the Arboretum on Saturday to help do a bit of spring cleaning! There is not much of a litter problem at the Arboretum, but it is nice to give it some extra attention every now and then. Thanks to these volunteers and to the regular users of the Arboretum for keeping it so clean! Just in time for Halloween, the native witch hazel (Hamamelis virginiana) is blooming at WVU Core Arboretum! Witch hazel is a shrub or small, crooked tree native to much of Eastern US. The native witch hazel blooms in autumn, after most leaves have fallen, and its flowers have a light, pleasant smell. Witch hazel is known for its ballistic seed dispersal, in which its seed pods burst open and launch its seeds up to 30 feet from the parent plant. It also commonly host to some fascinating aphid leaf galls (they are gone, now, but they will be back). The native and various cultivars and crosses of witch hazel are sometimes used in landscaping, and the bark is used to make the astringent topical witch hazel ointment available at pharmacies. The native witch hazel is one of the last plants to bloom at the Arboretum, an opposing bookend to the Chinese witch hazel (Hamamelis mollis), which is one of the first flowers to bloom. There are various accounts of how it got its name, but most link it to the Anglo-Saxon word wych, meaning bend. According to some, it makes a great dowsing rod, as it bends toward water (water witching). It is also often a particularly bent tree. The witch hazel has a rather long blooming period, and it is just now at peak bloom, so you should be able to visit and see and smell it for a week or so. It can be found near the bridge at the top of the Taylor Trail. Thanks to the volunteers who worked at the Arboretum on Saturday, September 26, and Saturday, October 3, as part of WV Day to Serve! These volunteers trimmed trails and cleaned tons of gravel out of drainage channels. Volunteers help keep the Arboretum looking beautiful! Stay posted on this website, on Facebook, and on iServe for the next opportunity to serve the WVU Core Arboretum. Almost 50 freshman honors students worked at the Arboretum on Friday, August 14, as part of the WVU Honors Day of Service. These students painted the rail around the parking lot, moved tons of gravel, trimmed lots of trails, and participated in a riverside sing along of Country Roads. Thanks to these students, the event coordinators, and the WVU Center for Service and Learning! Check out the press release and video for the welcome week service effort in which these students took part (the Arboretum made it into the video). Today was officially Jon Weems's last day as a WVU employee. Jon has worked at the WVU Core Arboretum for over 38 years, and the results and impact of his service are too great to be described by words. Thank you so much, Jon, for all that you have done for the University, the community, and the state. You will be missed by many. I hope that you have a long and happy retirement! One day last week, while Jon and I were eating lunch, I happened to look twice at a small ant crawling on my arm. Something was strange about the ant's head and the way that it moved. I poked at it and it jumped! Strangely enough, the ant was also trailing a web, which it frequently anchored to the surface upon which it was crawling. As you may have guessed, this was an ant mimic spider, and not an ant at all!! One of the most fascinating aspects of the mimicry to me was that the spider used its two front legs to imitate antennae (which ants have and spiders do not) by continually waving them around. This behavior is not very evident in the photo and also helped it only have 6 apparent legs. The spider's pedipalps were carried differently than they appear in the photo, too. They were positioned to look remarkably like ant mandibles. In other words, it looked even more like an ant than it does in these photos!! Some quick web research indicated that there are many species of spiders (over 100) in several families that mimic ants! Apparently this mimicry helps some species to avoid predation and others to sneak up on food. I captured the spider and put it in a zipseal bag to photograph and get identified later. That evening, I was able to get a couple of photos of the spider through the microscope, but nothing that I was really happy with--the spider was so fast that it was very difficult to position, focus, and shoot all at once--so I decided to try some more the following day. When I returned in the morning, the spider had escaped into my office!! Apparently, I did not have the prison bag zipped all the way tight. I was not worried for my safety, but I was sad that the spider was almost certainly doomed. Additionally, I only got three pictures that were not too great, and I was never able to get a positive identification to species. These poor photos are all that are left of the little spider. All are magnified, as the spider was only about 5 mm long. I think that it is a species of jumping spider because of the eye arrangement, but I do not know more than that. In the first photo, you can get a pretty good sense of its "antyness." In the third photo, you can really see the "spideryness" of its head and eyes. It was amazing to see this little spider, and I have been looking suspiciously at every ant since then. If you want a fascinating diversion, do some internet research on mimicry and all of its forms!! © 2019 West Virginia University. West Virginia University is an Equal Opportunity/Affirmative Action institution. 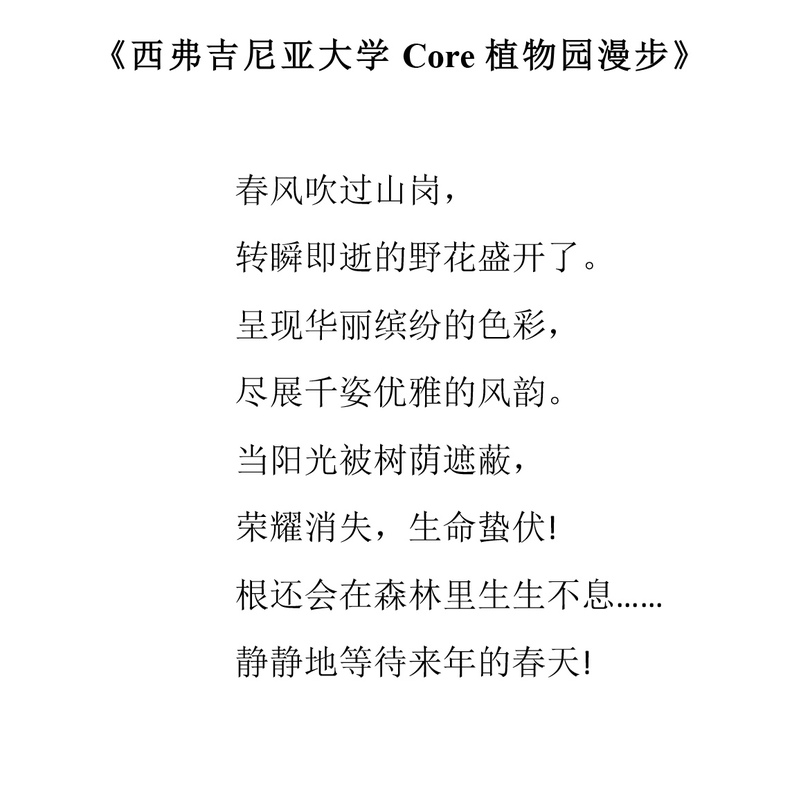 Last updated on March 26, 2019.